Charlemagne Tower’s Duluth & Iron Range Railroad built an ore dock at Agate Bay (now Two Harbors) in 1883; a year later the dock accepted its first load of Vermilion Iron Range ore, ten cars full pulled from Soudan, Minnesota, by the steam locomotive Three Spot. The railroad became the property of Illinois Steel in 1887, and in 1901 part of U.S. Steel; it was officially merged with U.S. Steel’s Duluth, Missabe & Iron Range Railway in 1938. 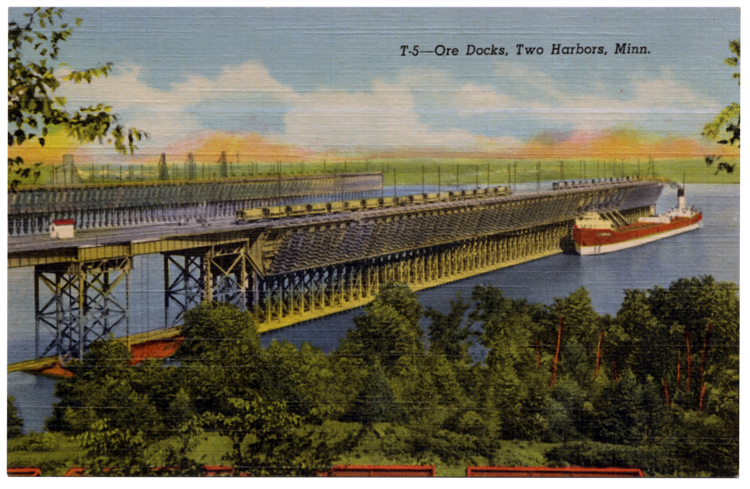 The railroads would eventually build six docks at Two Harbors. They reached an all-time high of 49 million tons in 1953. As the iron-rich ore was mined out, the docks slowed down. The Two Harbors docks actually closed from 1963 to 1966, when the mining industry picked up again with the development of taconite. Three docks remain, two of them still in operation.